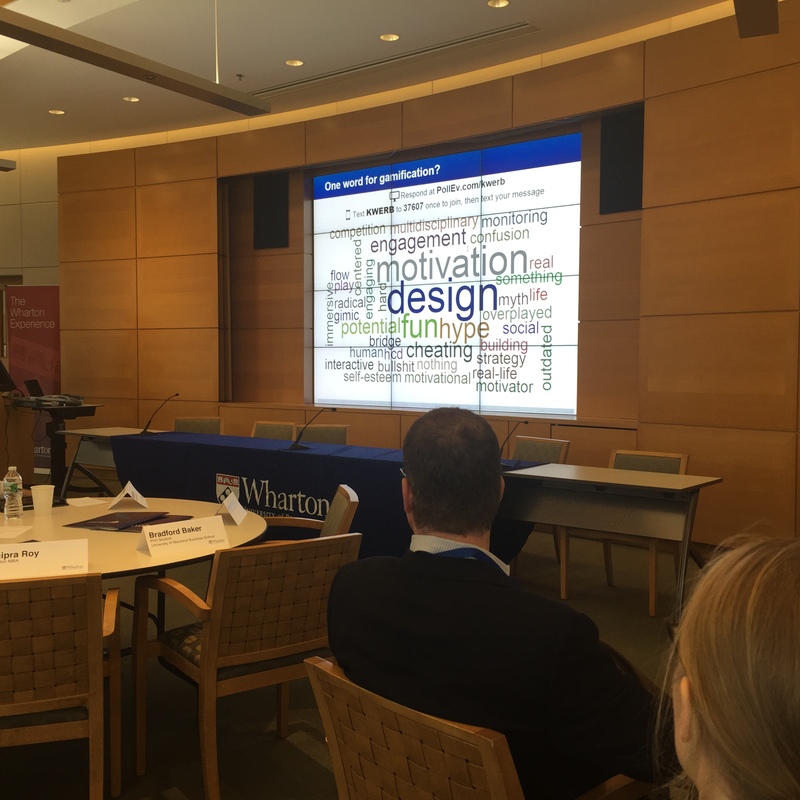 The other day I had the opportunity to attend a gamification summit held at the Wharton School at the University of Pennsylvania. 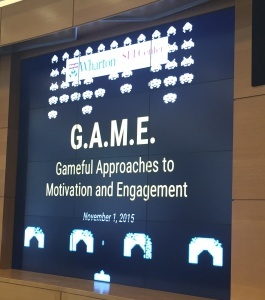 It was titled “Gameful Approaches to Motivation and Engagement” with the hashtag #WhartonGAME and it was attended by many of the most influential thought-leaders in both the academic and practitioner space in the arena of gamification. It was a veritable who’s who in the world of gamification. So I was excited to be included on the invite-only list and to rub elbows with many of people who’s work I read, track and follow and admire. 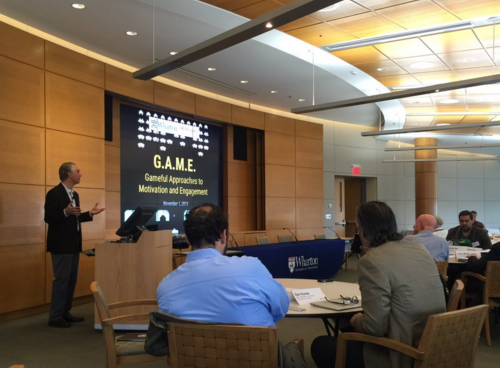 Kevin Werbach kicking off the gamification summit. 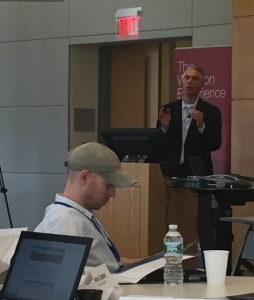 Kevin Werbach setting the stage for a day long discussion of gamification. We had a great chance to mix and mingle with each other in an attempt to build bridges between academia and practioners and to create research links, joint-projects and work toward mutual goals. 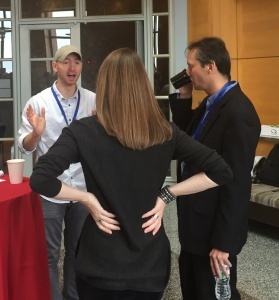 My biggest regret of the day is that there wasn’t enough time to talk to everyone with whom I wanted to speak. Too many people to visit with all day. The day started with a couple of questions. 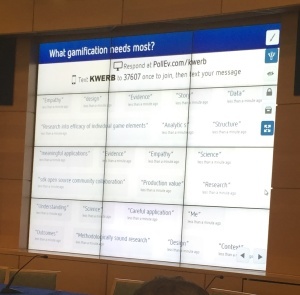 The first was give a one word definition of gamification. The group answers are below in the word cloud. The next question was “What does gamification need the most?” The responses to this question had many reactions. From researching the individual elements, to science, to design elements that make games engaging. What Gamification Needs Most? Group ideas. After the group questions, the format of the day consisted of time to mingle and panel discussions. The first panel discussion was filled with academics who provided insights into the current state of gamification. Interesting many of the panelist were looking into various elements of games and what makes them engaging or motivating. 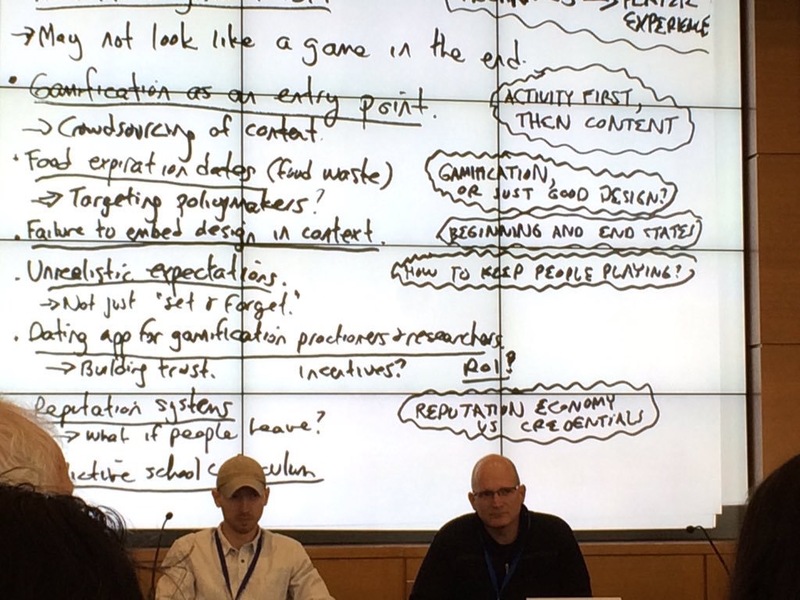 However, when asked…”what can we definitively say about gamification…what do we know for sure about gamification?” The academic panel was unanimous that it’s too early and that we can’t make any definitive statements about the current state of gamification research. This was a general downer in the room but the current body of is just not robust enough to clearly make statements about gamification. 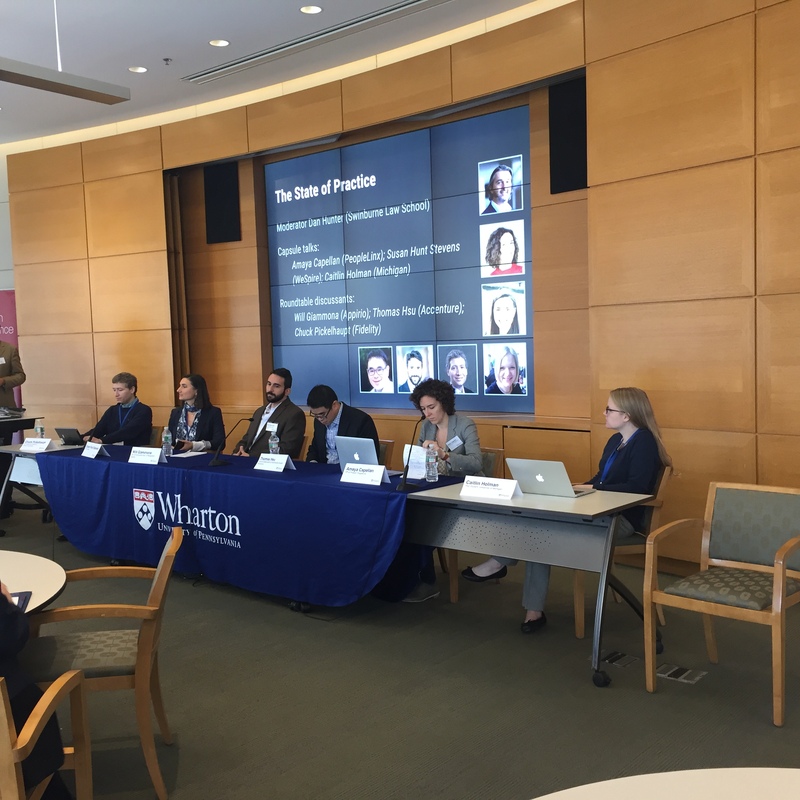 The panel consisted of Moderator Ethan Mollick (Wharton) who described some interesting work he has been doing related to a player’s sense of choice. Sebastian Deterding (Northeastern U.) who has done extensive work in gamification and re-positioning the concept as gameful design. Richard Landers (Old Dominion) who has done extensive work in several areas of gamification including work involving looking at virtual leaderboards as methods of goal setting and motivation. Lennart Nacke (U. of Waterloo) who is an Associate Professor and Research Director of the HCI Games Group at the University of Waterloo in Canada and works in the area of human/computer interaction related to games. Jonna Koivisto who is a researcher and a Ph.D. student at the Game Research Lab of the School of Information Sciences at University of Tampere in Finland. Jonna Koivista of the University of Tampere (Finland) is doing some great meta-analysis work in the field of gamification and co-authored a study called Does Gamification Work? —A Literature Review of Empirical Studies on Gamification. She is currently working on a meta-analysis of 300 gamification studies and hopes that will provide some insights. She said that of the 300 studies she is reviewing about 43% are in the field of education (the most, second was health and exercises then and crowdsourcing). So that may be helpful in the near future specifically in these three areas. Another researcher on the panel Sebastian Deterding who is an Assistant Professor at the Playable Innovative Technologies Lab at Northeastern University (Boston, MA), as well as a fellow of the RMIT Games and Experimental Entertainment Laboratory (Melbourne, Australia), and affiliated researcher at the Hans Bredow Institute for Media Research (Hamburg, Germany) indicated that we can “borrow” research from other disciplines to make assertions about what might be happening because of gamification but we don’t have definitive answers. Sebastian indicated that one of the problems with gamification research is that we have seen implementation study vs implementation studies on gamification and found that if you give people feedback on their behavior in a structured manner, it can impact people’s behavior. But we need more research on the elements of gamification before we can give guidance aggregated around gamification. 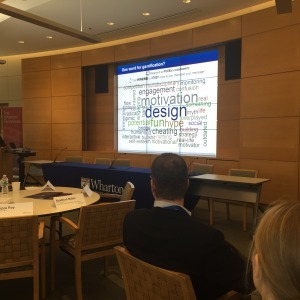 Richard Landers said that we know some things related to disciplines outside of gamification such as goal setting with leaderboards but we still need more research in the specific field of gamification. Research he is conducting. His study called “Gamification of task performance with leaderboards: A goal-setting experiment” which is currently in-press may shed some light on the best uses of leaderboards in gamification. He also mentioned that game designers and gamification designers use the same toolkit but they just use the tools differently. He has identified in his research nine classes of game elements that can be used as those tools. The panel discussed the fact that games are systems and that’s why it’s messy and hard to generalize because a game is a system and systems change and react to inputs and the inputs can be different at different times. When researching gamification, it’s important to remember that context and culture matter. When researching gamification, we have to think about the concept of design research, creating artificial elements, bringing technology together with social elements and processes. The evolution of the social system needs to be built into those systems and needs to be part of gamification research. 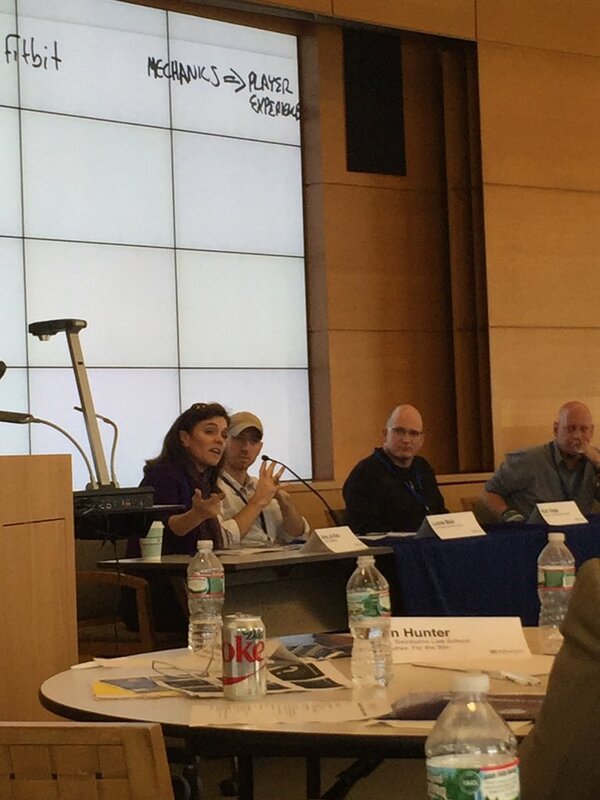 The next panel was centered on practitioners and their work in gamification. Chuck Picklehaupt, Susan Hunt Stevens, William Giammona, Thomas Hsu, Amaya Capellan and Caitlin Holman (left to right). The panel was moderated by Dan Hunter of Swinburne Law School (he is the founding Dean). 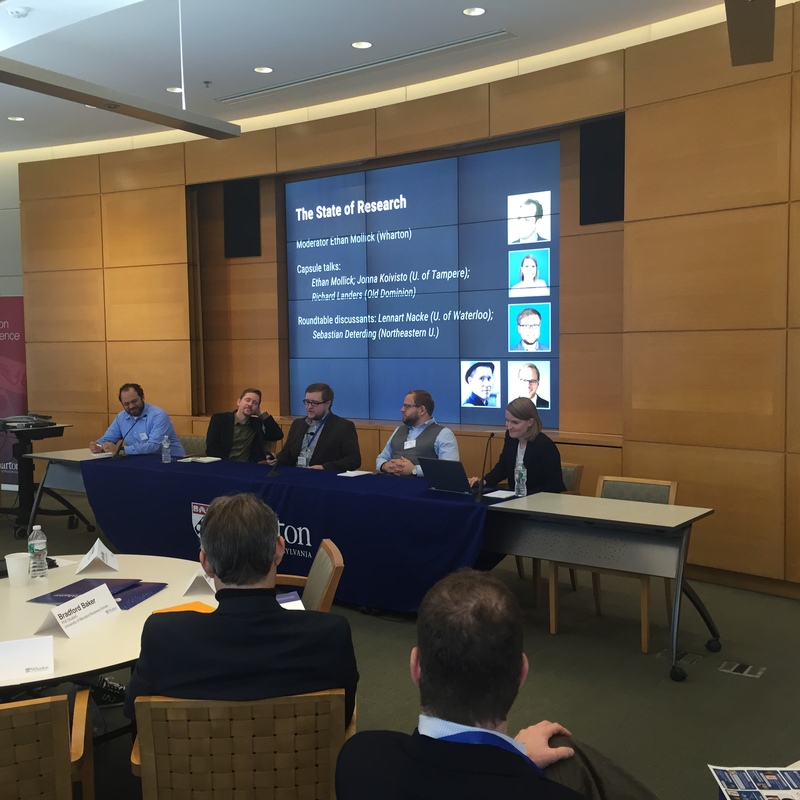 Joining him as panel members were Amaya Capellan of PeopleLinx, William Giammona of Appirio, Caitlin Holman of the University of Michigan School of Information, Thomas Hsu of Accenture, Chuck Picklehaput of Fidelity and Susan Hunt Stevens of WeSpire. It seems best to group “natural” teams together to compete rather than ad hoc groups. Group employees in natural ways they compete. When tested with ad hoc groups, the gamification worked well for first competition but didn’t on subsequent competitions. Theory is that it is not the natural way a group works and, therefore, once the novelty wore off, the competition wasn’t motivational. There seems to be a bit of a disconnect between Senior Vice Presidents (SVP) and managers trying to make it happen. The SVPs often don’t see a need for gamification or think about gamification but the mangers see gamification as helping with engagement and motivation to implement initiatives and make them happen. 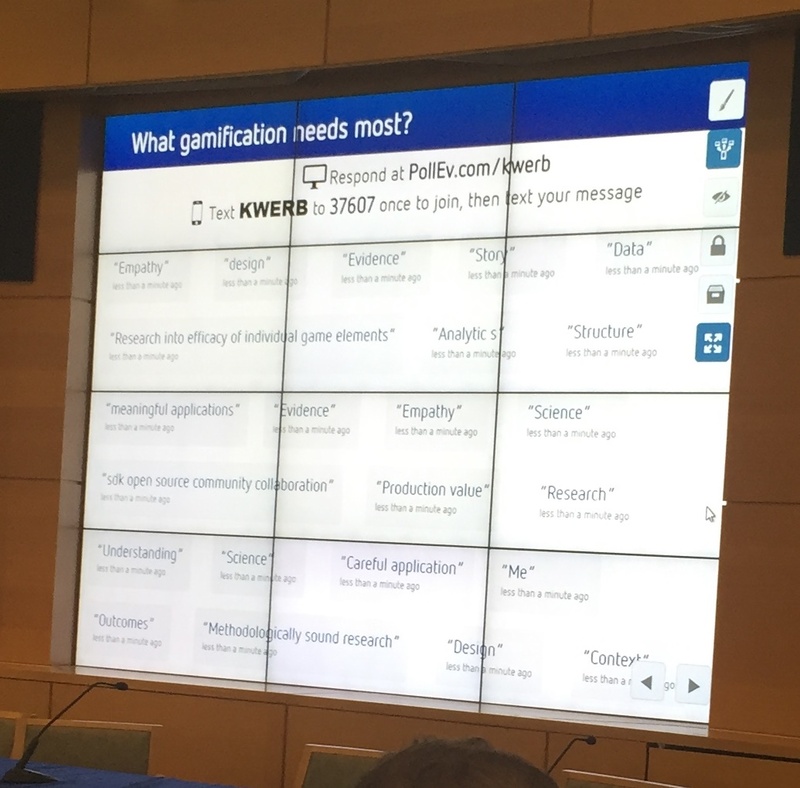 The final panel was called “Key Questions for Gamification.” I had the good fortune to sit on that panel. 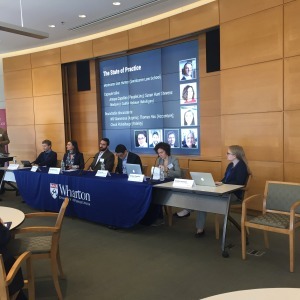 The panel was moderated by Kevin Werbach of Wharton and the SEI Center with Lucas Blair of Little Bird Games (and Bloomsburg University MSIT Alum), Amy Jo Kim of Shufflebrain, Karen Levy who is a postdoctoral fellow at New York University School of Law’s Information Law Institute and Ross Smith of IBM. 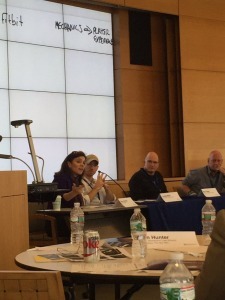 This panel asked questions from the attendees related to gamification. Kevin took notes on the projector as we discussed ensuring that the audience was first identified before developing gamification and that often instructional designers think about content first while game designers think about action and activity first. The idea of having learners or students create their own games was discussed as was the difficulty of breaking games into their “atomic” elements which may prove to be difficult even thought that’s a “holy grail” of research. 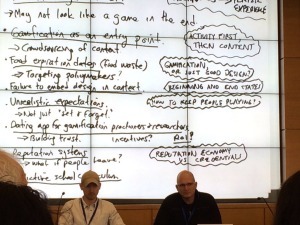 Lucas Blair and Karl Kapp address gamification questions. All-in-all, it was a great day in the neophyte field of gamification (although many are hesitant to call it a field). Many key connections were made, concepts and ideas discussed and some paths forward were discussed. Next the group will continue to discuss the key concepts and ideas and work to bring ideas from the practitioners and the researchers together to develop actionable, reliable and effective guidelines for using gamification in a variety of fields. 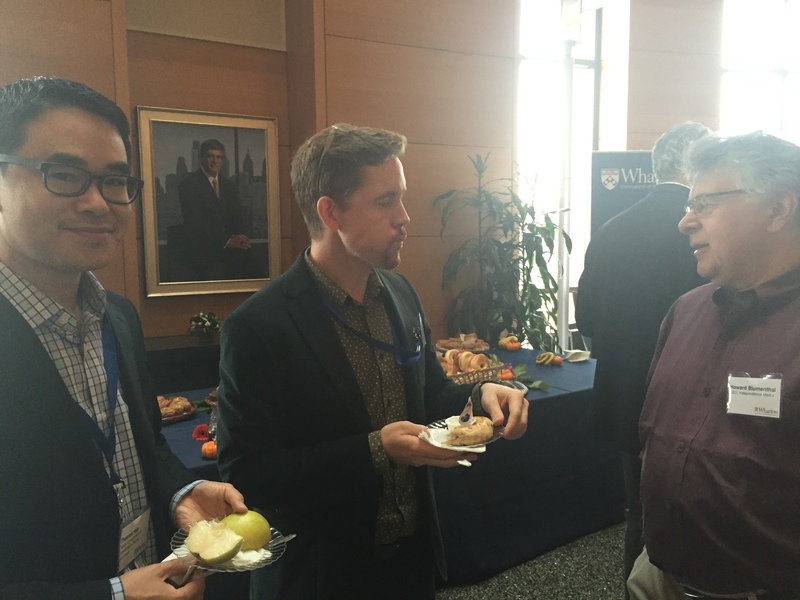 Lucas Blair talking with Zsolt Olah and Sari Gilbert.